The 12.9' Pro Backdrop Support Kit from Impact is a sturdy, secure way of hanging cloth backgrounds or seamless paper rolls weighing up to 38 lb. The kit comes with two stands and a telescoping crossbar. 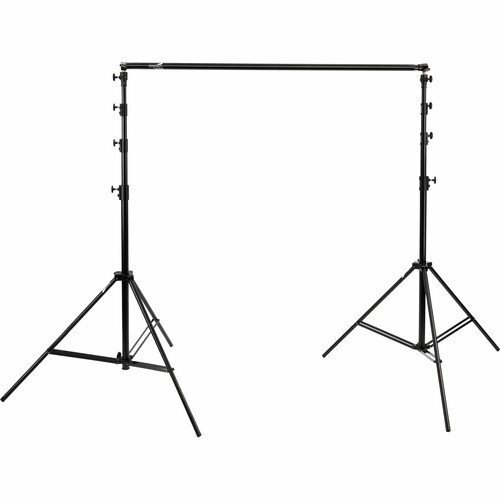 The stands have a maximum height of 12.5' - enough to give you headroom for low-angle shooting. Their minimum height is 3.6'. The crossbar telescopes from 4.8 to 12.9' - more than enough to handle rolls of 9' seamless paper and canvas backdrops. Reversible spigots with 1/4" and 3/8" mounting posts are included, allowing you to use the stands with other gear when not using the crossbar. It all fits in a provided deluxe padded case.